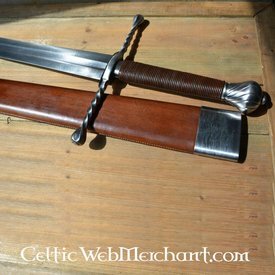 This type of sword was the demolition hammer on every 15th century battlefield. Contrary to his little brother, the XVa, this sword weighs approx. 2 kg and is not suitable for duels as depicted in Talhoffer and Lichtenhauer. 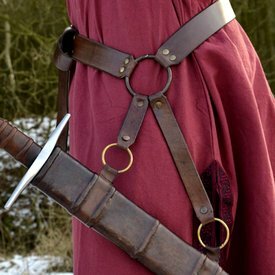 Instead every part of this weapon is made to break through armour. 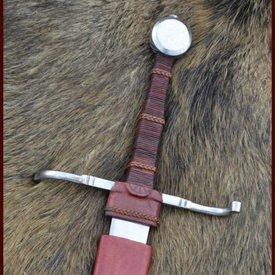 Because of its length and weight it can make a big impact, its grip can be used as a warhammer and the blade is just as pointy as the XVa so it can easily pierce through chain mail. 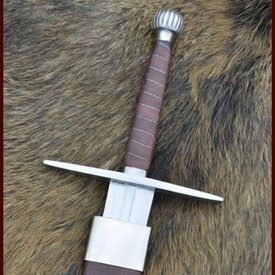 This sword is of course also available battle-ready for re-enactment purposes. 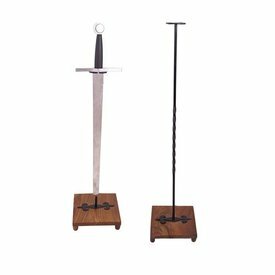 This sword has a length of 106 cm with a blade of 83 cm and a cross-guard of 22 cm. The blade has a Rockwell hardness of 44-48 HRC. 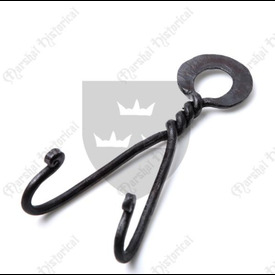 It is available with a grip covered with black leather, brown leather, un-dyed leather or steel wire. For the possibilities please see the drop down menus above.